Good morning! 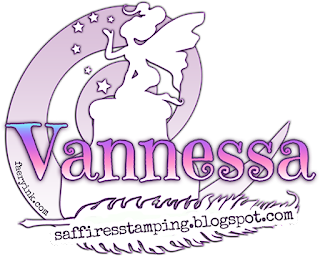 Vannessa here sharing my latest Faery Ink project with you all. Today I have used the gorgeous Gemma, who can be found in the newly released colouring book Pretty Girls With Wings and Things Vol 2. You can buy this colouring book as a pdf downloadable book or as a real paper book. I used the downloadable version because I can then use these gorgeous images at the size I want and add them to my cards and other makes. 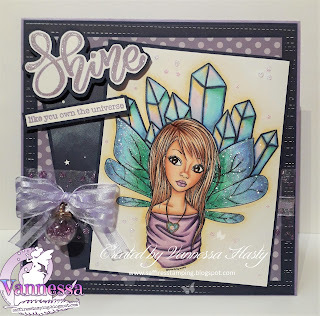 I really didn't know how to colour up the crystals so took inspiration from a colouring class I have previously done and love the multi-coloured effect of them. Although you can't see in the photo, I have covered them with clear Wink of Stella too for added shimmery-ness. I coloured her wings using some of the same colours as well so they would blend well together and then covered them with lots of glitter! Here is a larger version for you to see all the glitter! I also added some Clear Star Gelly Roll Pen to the large Shine part of the sentiment and some more dots of glitter around the image. You can never have too much glitter on a card, surely?! To top it off I added some glitter dot ribbon with some other shimmery ribbon and a bauble charm full of purple glitter too! And that's all from me for this post folks! Thanks for stopping by and see you all again soon!